This sweet little crochet pouch is quick to make but needs some advanced crochet skills as you will need to understand how to work in rounds. You will need double knitting yarn which is a UK weight of yarn. if you are not sure what this is in your part of the world then choose a yarn which suggests the use of 4mm knitting needles. You will also need a 5mm hook or nearest equivalent. 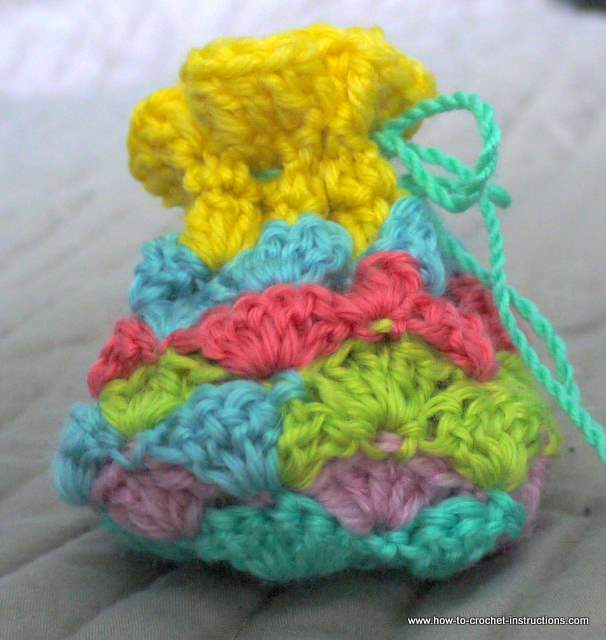 However you can make this little bag slightly bigger or smaller by using different thicknesses of hook or yarn. Make a slip knot and check that it tightens from the cut end. Make 11 more double crochet into the loop. Tighten the slip knot. Slip stitch into the top of the 3 chain. 3 chain, turn. NEXT ROW Make 1 double crochet into the slip stitch. Make 1 single crochet (UK double crochet) into the first stitch. Repeat from * to *, to end of round. Make 1 double crochet in slip stitch of previous row. Join with a slip stitch to top of 3 chain. Make 1single crochet into slip stitch. Make 5 double crochet into the single crochet stitch of previous row. Repeat from * to * to end of round. Slip stitch into the first single crochet of round. Make 2 double crochet into the single crochet stitch, then 1 single crochet into middle stitch of the 5 double crochet. Repeat from * to * to end. 2 double crochet into same single crochet that was worked into at the beginning of round. Slip stitch into top of 3 chain. * Make 1 single crochet into middle of the 5 double crochet stitches, then 5 double crochet into next single crochet stitch. Repeat the last 2 rows 3 more times, then one more row. (Total 10 rounds). On next 2 rounds, work a straight double crochet stitch into every stitch. Take a piece of yarn about twice the length of your arm and make a twisted cord. Thread the cord through every other space between the stitches on the second row down from the top. Pull tight and tie in a bow, and that's your crochet pouch done!